About: The Red Lion serves a wide selection of drinks. They also have live DJ's every night playing Funk, Soul and Hip Hop music. Although slightly rough around the edges the higher you climb at the Red Lion, the prettier the place becomes – until you find yourself on the terrace looking out over Hoxton. Sit or stand, partake in the BBQ or don’t, just enjoy the views in on of East London’s finest rooftop gardens. 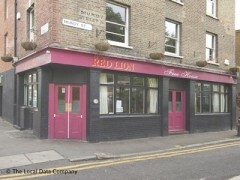 At the corner of Hoxton Square, The Red Lion has long been an attractive option for the curious and the carefree. Rough around the edges, yet packed with charm, the rooftop terrace is the place to find a touch of serenity in crazy old Shoreditch. "Just off the beaten hipster track"
When the liveliness of Shoreditch becomes too much and all you want is a quiet drink without having to stray too far, The Red Lion is just the ticket. Don’t be mistaken – you’ll still find yourself eavesdropping conversations on Swedish arthouse cinema and the new high-waisted linen pants on sale at American Apparel, but The Red Lion’s small space with warm, deep red walls and battered mismatched furniture will charm the most cynical of punters. It even has a fireplace which sometimes gets going in August, (though mind you, sometimes it’s needed). The upstairs of this traditional-looking pub just off Hoxton Square looks like the inside of a living room circa 1966, complete with floral wallpaper and matching cushions; so homely is this room we’re not even sure we’re allowed to be here as no one else has dared to enter since we perched nervously on the paisley print sofa. Apparently there is a roof terrace, however conditions have seldom been good enough to witness the alfresco option. Beers are under the £3.50 mark (good for the area) and there’s a menu with wholesome Ploughman’s salads with pork pies, sausage baguettes and steaks. Perfect for long chats on cold evenings. "what it lacks in get-up it makes up for with a good atmosphere"
Roar! Be brave, it’s the Red Lion, Hoxton’s grimy old palace and home to hipsters since Shoreditch was a Victorian bog… or something. This has never been the new thing and you could imagine it was built with this interesting mess of styles pre-planned. On the edge of Hoxton Square, the multi floors stockpile various brass tables, open fires, installations, mirror balls and printed walls that have been copied all over the area. It’s tatty, but the rough edges set it apart from pubs like the Old Blue Last, which spruced up and lost itself a while ago. Nothing particularly disguises the fact that it’s a battered old place but what it lacks in get-up it makes up for with a good atmosphere. There’s sixties garage on the stereo and it’s unexpectedly unpretentious for this kind of place. This isn’t the ‘Shoreditch Friday Night’ area so you can avoid big groups and fit in with what tends to be a more mature crowd these days. The beers are standard but cheaper than most and there’s food in the way of pizza and bar snacks. It’s a good place to start and Hoxton Square’s pleasant in itself but if you do need something a little more affected than the Red Lion then step outside because it’s all on your doorstep.